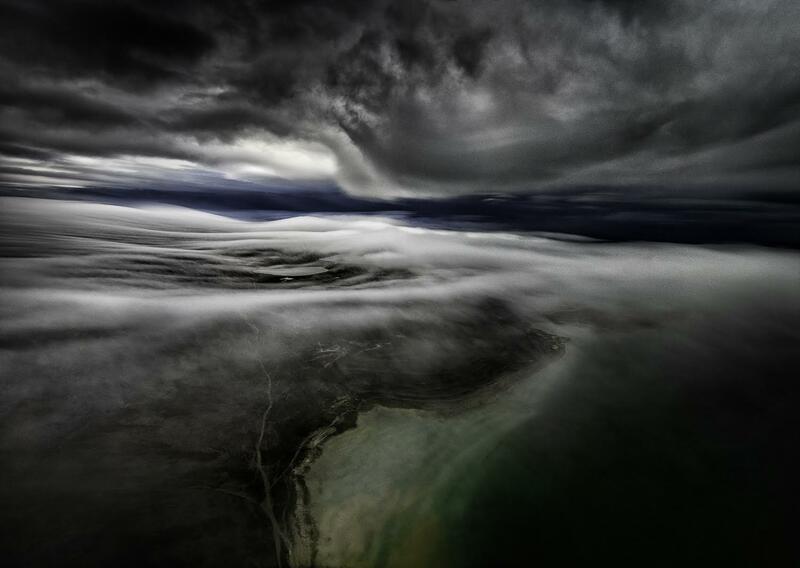 Michel Thibert has been flying and photographying the Canadian Arctic for many years. He gives to Terra Quantum an exceptional testimony. My photographic art is striving to visually extract and isolate a part of nature, using my concept of forms, to unravel a significant and relevant perception of this part of the world. That world is the Canadian Arctic, also named True North or Nunavut. My two passions are inter-dependant. I need to be a pilot to gain frequent access to inaccessible Arctic destinations year round. I also need an artistic outlet to share the feelings evoked experiencing some of the most rarely seen landscapes from the farthest corners of the Canadian Arctic. I still have the chance to fly all around the True North where very few if any, have stopped to capture the moments. My selected portfolio to be presented to Fotofest 2016 offers to unravel some of the mystique of these distant places. Several works took over six years to properly capture their essence. I would like to celebrate the beauty and the loneliness of such a remote region. Together we can relate to a common perception of our True North, a still whiteness, a time before the disappearance of this vast territory. I must respect the general route of the aircraft. The baseline sequence is the one where I have to anticipate, construct the scene and adjust the aircraft path to capture the scene. Sometimes, I wish I could have stretched time to revisit a scene over. On the ground, we can compose and wait for the exact light and subjects, but at 230 km per hour in my aircraft, the scene is always evolving. Aircraft routing, final destinations and current weather set the mood of my scenes. Few visitors can afford the remote Arctic destinations and frequency of my visits. The trip of a lifetime is for me a periodic exchange with companions in the Arctic region and the communities visited. Some strive to eliminate surprises and maximize comfort. My agenda is better filled with those unscripted moments of pure excitement. My competitive advantage is the frequency of my presence in the True North and the prolonged stay in local communities. Generally speaking, we are more comfortable in our predictive environment than dominated by nature. For me, it’s the opposite. Through my photographic signature, I invite the viewer to experience with me areas that one may otherwise never see. My profession as a pilot in the Canadian Arctic allows me around 15 days a month in my preferred territory. Nunavut is definitely a unique territory in the world. From its sheer size of 2,093,190 km2 (808,190 sq. mi), the size of Nunavut represents 21% of the total surface of Canada (9,984,670 km2). True Canadian North also has its unique cold climate. Short summers and prolonged winter nights make it a harsh place to live. This Canadian territory goes by a couple names, often called Nunavut, also named Canadian Arctic or True North. It has a definite influence on the temperature at a global level. Just imagine a territory that is so vast that it constitutes the fifth-largest country subdivision in the world, as well as the second largest after Greenland. Even if the world knows much more about the ice conditions than a decade ago, its harsh climate with an average temperature of -36 Celsius in winter time, and prolonged hours of darkness, make it difficult to access. The gigantic territory is not serviced by any highway or railroad. Air is the only regular transport in and out of Nunavut. Because of the ever-changing ice conditions, boats might come only once a year in certain towns/ hamlets. The Canadian True North is one of the most remote, sparsely settled regions in the world; it has a population of 36,687 (2014), of which 84% are Inuit. The density of the population is 0.02/km2 (0.052/sq mi). Most of the inhabitants only regroup in one of the 28 communities / hamlets, which make it a very lonely place. Global warming is no longer just a question mark; it’s a current and future reality regarding climate change with severe consequences. Only the sources and amplitude might be debatable. Notwithstanding, the True North is playing a role in the stabilization of the global climate, oceans having deep currents linked to the North Atlantic, it is without hesitation that we admit that the world’s attention is going to turn toward this wild region. Inhabitants and locals observe a deep change in the landscape and the profound current and foreseen impacts it’s having on our planet. The current True Canadian North will never be the one we have observed over the last centuries. Can you afford to have the door removed and control the aircraft? If not, select a seat with an unobstructed view (rear or front aircraft... but you might still see the wings). In the front, you also have less combustion gazes from the engine. Use a lens as wide as possible below or around 50mm and over 20mm (longer lens tends to capture the elements in the air and the scratches on and in between the windows), use around F8 and over 1/250. Take a picture at 60% of the height of the subject, with a flat angle; increase the distance to the subject to keep 2/3 horizontal that will fit the width of the whole subject. Reduce the speed of the aircraft in the approach and departure speeds (120-160 knots). Also, to reduce the light reflections from the inside of the cockpit to its inner glass and to diffuse that light within that glass or plastic, you should select and angle of the aircraft accordingly. The objective is to have more light intensity outside the aircraft and less light intensity within your shooting environment. The surfaces close to your lens will probably send some reflections to the windows. Use a black velvet cloth to reduce the reflections coming from your shooting environment. A graduated soft edges neutral density of 2 to 3 stops is recommended. The humidity in the aircraft would generally condensate in the windows and sometimes it will freeze. Helicopters require an increase in the shooting speed due to the numerous shaking parts that will be transferred to your body. You most likely will have to recompose the scene in Photoshop. Certainly a bigger sensor will be more useful, as you might have to decide to remove or not some of the aircraft’s components. Horizon is hard to forget when flying. It sets the scene; it sets the proportions and the dimensions of respective objects. It is very rare that it doesn’t have to be corrected flat. Watch for those cameras who allows a 9 x 16 panorama look, edges might be curved and dull. Look for any combinations of light reflections that create erratic and short living shapes. The scene will last less than 15 seconds. My camera is always on stand-bye mode and ISO are adjusted to the light intensity and the aperture is close to F8 and not below F5.6. Being closer to the stars for 800 hours a year and in front of the cockpit, I have the chance to capture about 1000 pictures a year. I generally keep less than 50 and my favourite involves clouds in the Canadian Arctic. Below are examples that I especially like because they illustrate some of the specificities of the aerial photography on a technical or artistic point of view. The first one seems simple at first glance but it is actually extremely challenging. It consists in playing with the wing and putting it into the composition as an element of the scene. The main difficulty comes from the high degree of precision that is required in such scenes. As the aircraft attains its cruising altitudes, my attention is more relaxed and is now focussing on the scenes a few thousand meters below. Anticipation is my key attitude. Flying at such high altitudes gives me the opportunity to recompose my knowledge of that specific area. When you are within a scene and so close to the subjects, we all try to generate very similar scenes that are most likely a product of mass media and education. But when looking at an area from high above, it allows you to recompose our common standardized images. I travel from a known surrounding to a sum of confusion and new knowledge resulting from such a perspective. The product is most of the times a diminutive of the complex 3D spaces, textures and lights enveloping the aircraft and myself. Cooperation of the passengers is the key to the foreseen scene. When I carry passengers they must share what I will be capturing. That is in a conceptual and a practical sense. In this capture close to Grise Fiord, I wanted to integrate the left wing into the picture. My intentions were to use the black wing to guide the observer into the wilderness of high Canadian arctic and to present the multitude of textures. The matching lines captured help to plunge the eyes of the observer and share the cyan lake and the surrounding of this melting glacier in 2015 summer time. 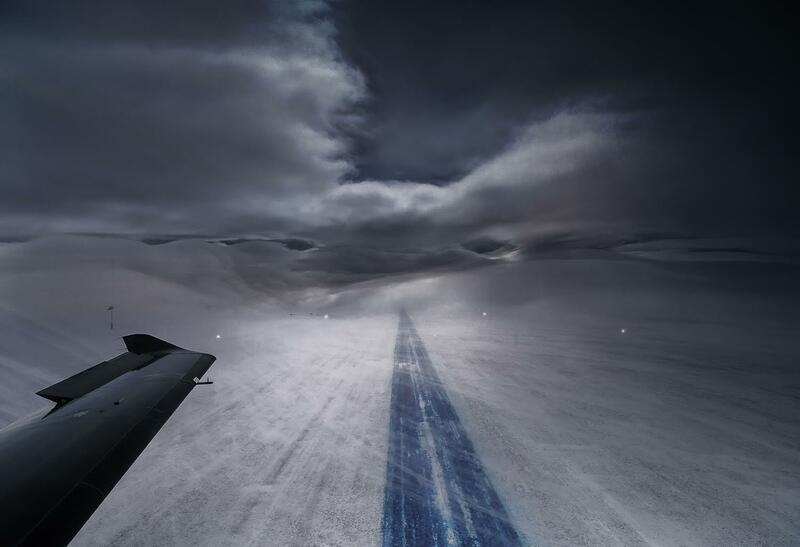 In this caption of the runway 33 of True North of the hamlet of Igloolik my intention was to illustrate the weather phenomenon named a “whiteout”. This term refers to this particular situation where there is no visible separation between the sky and the ground. In the critical phase of the initial aircraft acceleration we have to consider the forward visibility and the right and left side references. In this whiteout the conditions varies from a ½ mile to a little bit more. You will note that the centreline of this gravel runway was covered with snow and soaked with a blue colorant. The left wind was somehow obscuring the forward visibility by throwing the dried up snow. It could be intimidating and the lost of references is a threat to aviation. This particular picture was sold to an industry magazine. Every season has its unique signature of clouds in the True North. In this capture on Aaugust 21th, the fall season is coming in the Hamlet of Taloyoak in Nunavut. Its length may be extremely brief but offers unique photographic moments. 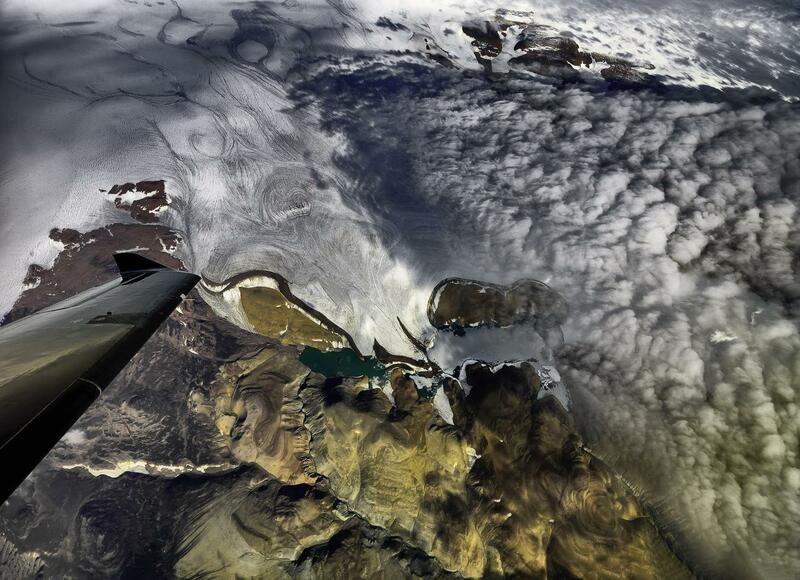 This scene was captured around 500 meters in the initial aircraft climb, with the intention to seize the numerous clouds layers. The unique weather in True North reflects a large spread in temperature that allows condensation of the surrounding lake’s humidity into a unique blend of clouds. Very often, in True North and elsewhere probably, the sun rays are the first to light the scene with gentleness. It is only when the clouds remove themselves from mother’s nature robe, with the help of the wind, that we allow ourselves to capture its magnitude. In this confusion for the horizon search, we are striving to establish our emotions with such a push from the northern wind. With no obstacle to stop this powerful breath from mother nature. This unique moment lasted less than a minute, as the aircraft climbs at 800 meters a minutes to a dormant altitude were the elements are more stable."